Qt for Embedded Linux uses the FreeType 2 font engine to produce font output. The formats supported depends on the locally installed version of the FreeType library. In addition, Qt for Embedded Linux supports the Qt Prerendered Font formats (QPF and QPF2): light-weight non-scalable font formats specific to Qt for Embedded Linux. QPF2 is the native format of Qt for Embedded Linux. QPF is the legacy format used by Qt/Embedded 2.x and 3.x. Several of the formats may be rendered using anti-aliasing for improved readability. 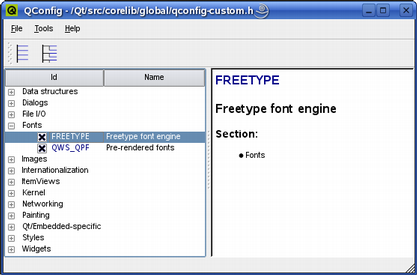 When Qt for Embedded Linux applications run, they look for fonts in Qt's lib/fonts/ directory. Qt for Embedded Linux will automatically detect prerendered fonts and TrueType fonts. For compatibility, it will also read the legacy lib/fonts/fontdir file. Support for other font formats can be added. To make a suggestion, please create a task in our bug tracker at http://bugreports.qt.nokia.com. The FreeType, QPF2 and QPF formats are features that can be disabled using the feature definition system, reducing the size of Qt and saving resources. See the Fine-Tuning Features in Qt documentation for details. The Qt Prerendered Font (QPF2) is an architecture-independent, light-weight and non-scalable font format specific to Qt for Embedded Linux. Nokia provides the cross-platform makeqpf tool, included in the tools directory of both Qt and Qt for Embedded Linux, which allows generation of QPF2 files from system fonts. Nokia provides support for the legacy QPF format for compatibility reasons. QPF is based on the internal font engine data structure of Qt/Embedded versions 2 and 3.